My friends, if you love pumpkin, this is a recipe that you’ll definitely want to add to your fall, Thanksgiving and Christmas recipe list. This Simply Superb Pumpkin Bread is the bomb! The recipe originated from a family friend and I’ve been making it for years. It’s excellent served warm or cold and is a totally yummy treat to accompany a cup of your favorite hot beverage. Try serving a slice with a dollop of soft cream cheese or a bit of butter spread on it. Delicious! A moist and delicious recipe to serve for dessert, as snack or as an appetizer. Grease two 9 x 5 x 3 loaf pans or three 8 1/2 x 4 1/2 x 2 1/2 loaf pans. Mix shortening and sugar in a large bowl until fluffy. DO NOT use a mixer. Pour into pans, dividing mixture evenly. Take a look at how moist and delicious this looks! it’s the perfect dessert, snack or appetizer and makes a great take-along dish to any gathering. Your friends and family with thank you, I promise. It looks so yummy! I have to try this recipe. This is the exact pumpkin bread recipe I have been using for years, except my recipe calls for 2 2/3 c. sugar. Is that a typo in your recipe? I discovered it in the 1980 Southern Living Annual Recipes Cookbook. That cookbook is one of the best of their annual cookbooks, my copy is falling apart. Thanks for sharing. I think I’ll make some bread this afternoon! My husband loves pumpkin bread! Hi Linda. You are right about the amount of sugar! Thank you SO much for catching my mistake! I’ve corrected the recipe. It looks delicious. I’ve made an apple quick bread and two loaves of zucchini bread in the last couple of weeks…it’s just that time of year and heating up the oven is pleasant to do. Looks really good! Thanks for sharing on the What’s for Dinner link up and don’t forget to leave a comment at the party – Next week’s features that also leave a comment get pinned, yummed and tweeted! Looks good! Will have to make! Oh I love me some pumpkin bread with pecans and cream cheese on top. I don’t know why we don’t make pumpkin recipes all year! I love pumpkin, & I can’t wait to try this recipe! It sounds delicious! I made the bread with only 2/3 cup sugar. It is delicious! Really, now I would not add the extra 2 cups of sugar. I am now rethinking other recipes and cutting the sugar. Have you ever frozen the bread? I would like to freeze 1 loaf. Hi Linda. That’s amazing about the sugar! I’ve never frozen the bread, but I can’t think of any reason that it wouldn’t freeze well. Yum! I need a good pumpkin bread recipe. I saved this recipe to my book! I haven’t tried the Pumpkin Bread recipe yet, but does it really have 2 and 2/3 cup of sugar in it? That seems like a lot. Please let me know asap before I make it. Thanks. Hi Mary. I double checked the recipe and it DOES call for 2 2/3 cups of sugar. I’ve made this many, many times, so I know it’s correct. The recipe in the post has been corrected, in case you want to print it out. Happy baking! 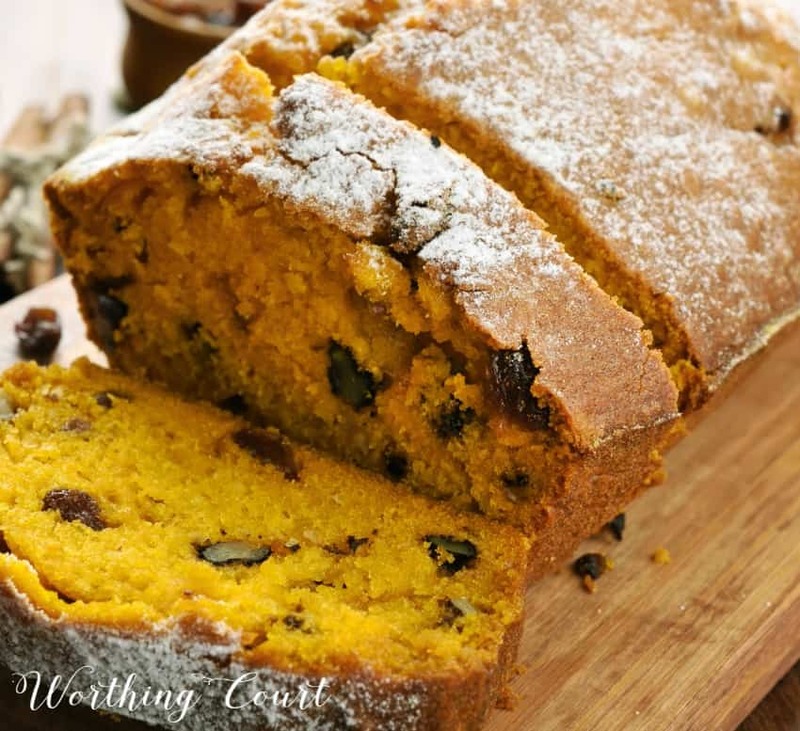 We love pumpkin bread for holidays, I’m trying this recipe this weekend. I got all the ingredients, came back to look at recipe…thank you!! I am making this tomorrow. I have all the ingredients on hand. I know it will be great. Thanks for sharing! Your recipes are ALWAYS delicious, and so easy to print. Thanks for that option on your sight! Just printed the pumpkin bread recipe and plan on making it tomorrow! This looks so yummy. Thanks for sharing this wonderful recipe. Cannot wait to try this bread. Looks amazing. Thanks for sharing. Saving this recipe to use all winter! My family loves pumpkin anything and this looks amazing! This recipe looks very easy and the Pumpkin Bread looks delicious~I’ll have to try it with almond flour, but I bet it will be just as good as yours. This looks so YUMMY! 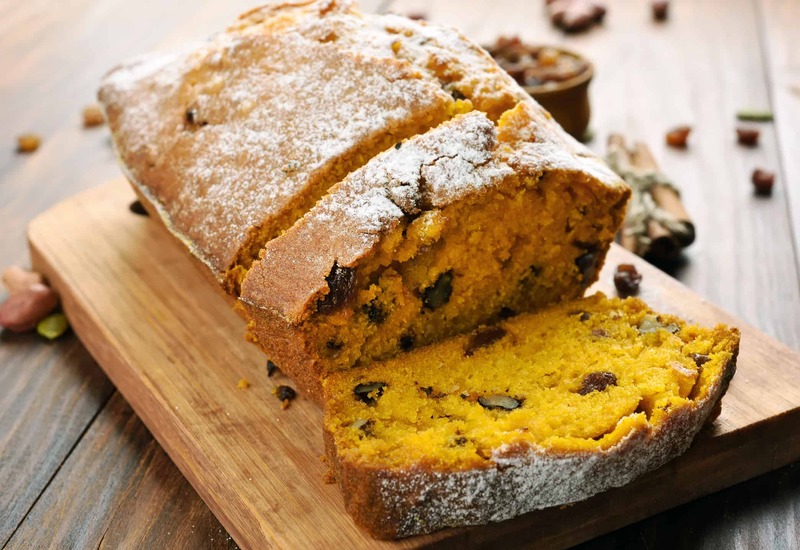 We love pumpkin bread, can’t wait to try it. I made this pumpkin bread for Thanksgiving morning and it was fantastic! Thanks for sharing. My daughter LOVES pumpkin bread!! This one will definatly be on my “to make” list for the holidays! Just had to pin this one to try too! Thanks for sharing such a nice recipe. This is the same recipe published in ‘The Southern Living Cookbook’ in 1987. The difference is, in the cookbook it only calls for 2 cups of sugar and only 3/4 teaspoon of salt. It was always wonderful made this way!